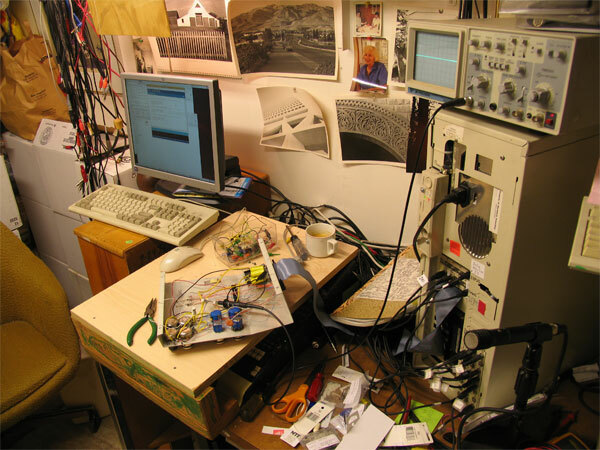 At one point in time in early 2008 you could listen to a live ogg vorbis stream coming from this synthesizer. You could just enter this URL http://63.199.138.245:8000/live.ogg and click play. The box could also be "played" over the internet using VNC remote desktop capability. Scot Gresham Lancaster and I were working on a control web page that anyone could use. The concept we had in mind was to set up the box such that it can be used as a "sound sample mine". It is a one of a kind synth of extremely high complexity which is capable of producing an infinity of novel sounds. We would like to see musicians use it to produce unique sound samples they would then use in their conventional synthesizers. The waveforms	the synthesizer produces are extremely complex. Mark and Scot worked together (Mark doing the lion’s share) on this. Scot performed in Hoboken, NJ at Stevens Institute of technology with a wii into pd and with vnc on my powerbook talking to Mark’s ubuntu box in his garage Palo Alto with an arduino hanging off of it. I then remotedly reprogrammed and compiled “processing” patches on the ubuntu box which changed the “state” of the neural net synthesizer. The audio from the “Neural Net Synthesizer was running icecast on the ubunutu box and then I was using VLC to play it back in the performance space. I (Scot) have been performing in many extended technology contexts, but this was definitely the most extreme! This instrument is one of my favorite instruments in the world. The back burner plan that I am hoping Mark and I can get some time for is to make one of the world’s rarest and most spectacular electronic music instruments, the most accessible, by hooking it up to the internet in this same way and letting people change the parameters (within a scope) and actually play ( well really it is more like steering ) this instrument. Below is the box as of 4/2/08 as it is streaming audio from my garage in Palo Alto, Ca.. 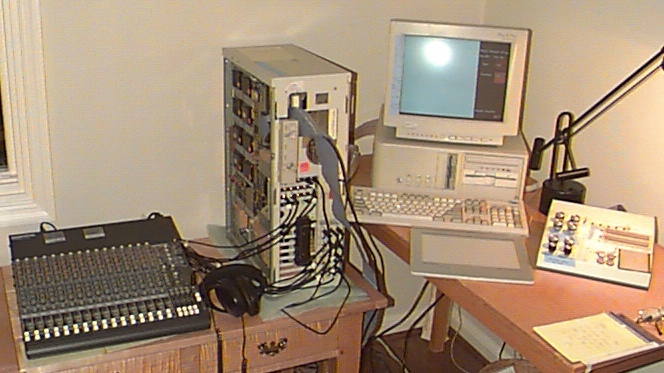 The PC on the left is an Ubuntu Linux machine running the MuSE compressor and Icecast2 streaming audio server. The PC is also running an arduino development environment that is used to upload programs via USB to the arduino board shown below which in turn drives 6 pulse width modulated streams into 6 low pass filters which are connected to 6 biasing voltages in the control panel. You can see the control panel upside down with its cover off in the middle bottom of the picture above. These biases control the operating points of neurons in the neural synthesizer. Music Box 2 is a joint project with Forest Warthman, Simon Tam, John Adams and since 2007 Scot Gresham Lancaster. 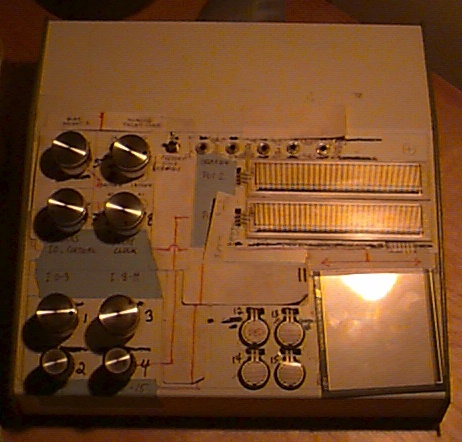 It is a hybrid Analog neural Network/Digital 386 computer device designed to produce complex audio waveforms in realtime. The box has produced many novel sounds never heard before some of which are included below. Brief history of Box II. Note that Hewlett and Packard started out building audio oscillators in a Palo Alto garage about 5 blocks from here. Please excuse the technology orientation of this page. The first performance artist to use Box 2 to entertain live audiences was John Adams. John has been affiliated with David Tudor and the Merce Cunningham Dance Company where Box 1 was used successfully in performances internationally. Simon Tam programmed the initial text based controls for Music Box 2. Mark Holler later programmed the graphical user interface which allows weight setting with pen strokes on a tablet. Here are a few pictures that give an overview of the system. 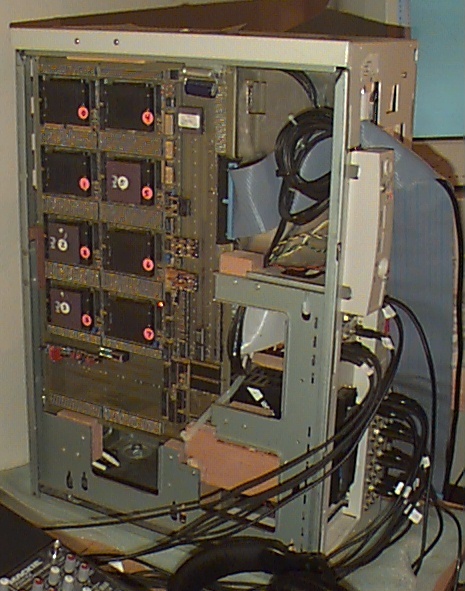 This is an overall view of the system. 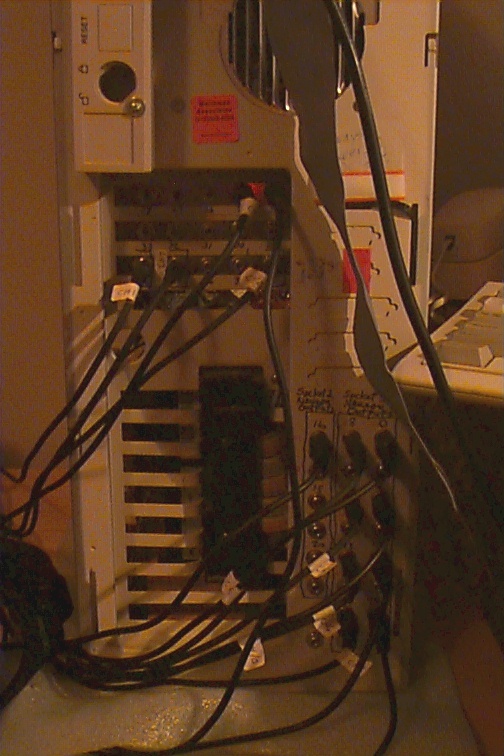 From left to right, Mixer, Analog Neural network system using 3 Intel 80170NXs, Std. 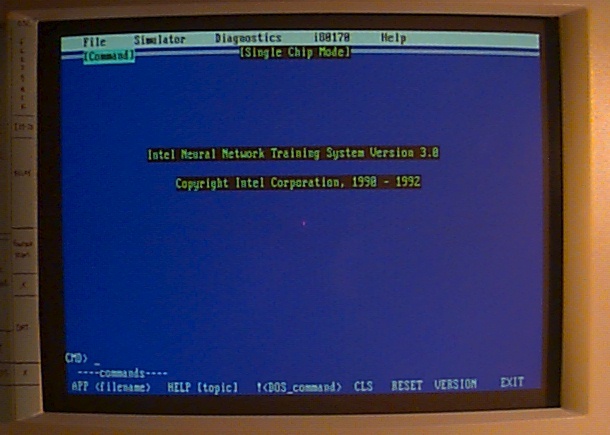 Intel 386 PC with pen tablet in front of the keyboard, Analog audio control panel. In 2007 Holler concluded that the complexity was just too high for any human to manage interactively. Imagine a keyboard with 10,000 keys. 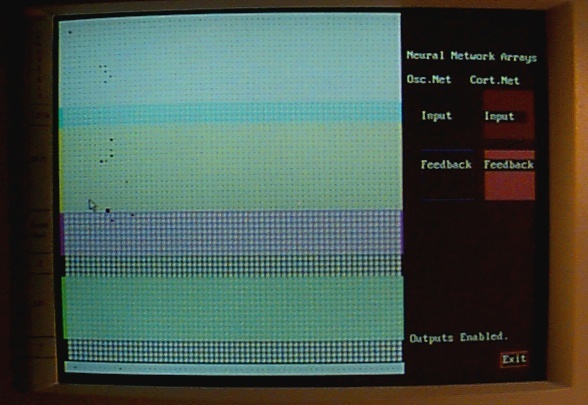 Even with the computer helping and a graphical interface it was still very difficult to control. It isn't hard to get sound out of it but, getting sounds you want and getting them fairly consistently is tough. Holler decoupled the computer and the weight setting interface from the neural circuit board and basically make it a "Stand Alone" synthesizer. Its controls now consist of 8 potentiometers on the control box shown at the right above and all the mixer controls on the 16 channel mixer at left. The "musician" playing it also has about 2 dozen patch cables to connect the 24 neuron outputs of the synthesizer to the mixer and back into its 12 or so external inputs. Think of this cabling as feedback paths through the mixer that can be controlled by the mixer. External music sources can be inserted through the mixer as well. This is a close up of the analog control front console. Neuron biases in the lower left, feedback clock, delay line clock, cortical bias and gain control for chip in upper left. Touch sensitive neuron bias controls on right. Patch panel for Analog Neural Network box. Mostly Neuron outputs some inputs for feedback. 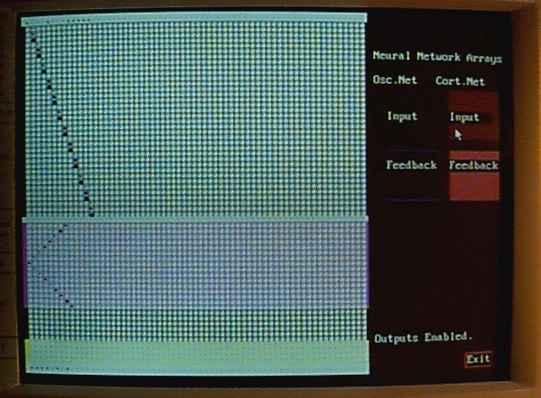 Side view of Analog Neural Network showing three 80170NX neural network chips (mauve color squares with white labeling). 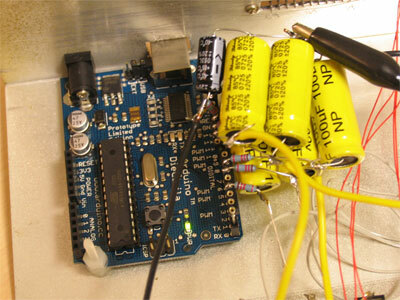 Also visible are some of the capacitor resistor components which define the circuit time constants. The chip at top right with the rectangular white label is the analog delay line. Weight setting screen for setting oscillator weights. This is just the input array of 4096 weights. There are another 4096 weights in the feedback array of this chip. The size and color of the dark squares in this Hinton diagram like display indicate the polarity and strength of the weights set in the analog neural network used as relaxation oscillators. columns correspond to Neurons/outputs and rows to Inputs. This is a similar view showing the weights for the array used to model cortical pyramidal cell behavior. This array is more regular because two specific weight values per neuron are required to achieve spiking behavior like biological neurons. Note the timings, pulse width and average firing rate of these artificial neurons is closely matched to the timing of real neurons. User's Guide to Music Box 2 Written by Forrest Warthman This was written prior to development of the Graphical User's interface but, it still contains critical information for understanding how the box operates.